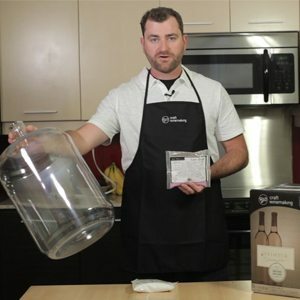 Proper sanitation is the most important step to successfully crafting your own wine. Poor sanitation is the number one cause of spoiled wine and can be easily avoided with the proper attention. Cleaning is NOT the same as sanitizing. Cleaning uses water, cleaning agents (e.g. detergents), and mechanical means (e.g. water pressure or bristle brush) to remove organic and inorganic matter. Cleaning agents break down, solubilize, and disperse contaminants into water, so the contaminants can be washed away. Sanitizing uses specialized chemicals to inhibit/kill micro-organisms, such as yeasts and bacteria, down to an acceptable level. Poor cleaning and sanitizing regimens are common causes of problems, typically microbial spoilage. Clean and sanitize ALL equipment that will come into contact with juice/wine. Use appropriate cleaning and sanitizing agents for the type of material, i.e. glass, stainless steel, plastic, oak barrels, etc. Some products include cleaning and sanitizing agents to perform both steps into one. NOTE: If you are also a beer maker, some products may not be adequate or suitable for winemaking equipment and vice versa. use fresh, clean water and pressure to dislodge any excess material before you begin. Only use recommended agents for the type of material; do NOT use soaps – these leave a residue that will affect taste of wine. Use recommended dilution rates (see Table); do NOT use higher dilution rates – may damage equipment. Dissolve agent in cold water; never add water to a cleaning and sanitizing agent. Ensure cleaning solution reaches entire surface. Use a soft-bristle brush or other soft material to scrub residues and stains; do NOT use any abrasive material – scratches become a breeding ground for micro-organisms. May need to soak for a short period to dissolve tough stains but be aware that extended soaking may damage the equipment. Rinse equipment with fresh, warm, clean water before sanitizing. Remember: you CANNOT sanitize a dirty surface. Remember to use a suitable sanitizing agents for the type of material to be sanitized. Leave sanitizing solution in contact with surface for the appropriate amount of time. Rinse out equipment one last time with fresh, clean, cool water. Let equipment drain of excess water. Ensure there are no residual odours. It’s important to understand the formulation of cleaning agents so you understand how to handle and use the various products. Cleaning agents are formulated with one or more “active” ingredients that perform the cleaning action plus other chemicals, such as surfactants and/or foaming agents, to increase cleaning efficiency. Some cleaning agents include a sanitizing agent into one product to simplify labour and reduce costs. Formulation is often a trade secret and, therefore, ingredients are not always listed on packaging or even in the MSDS. Store all cleaning agents and solutions in airtight containers. Rotate your stock at least every 6 months. 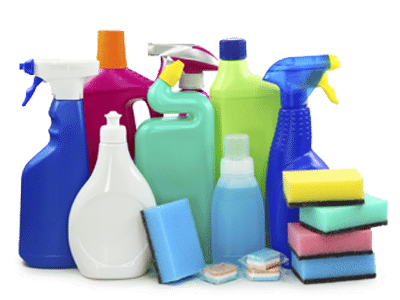 CAUTION: Always use cleaning agents as directed on package and NEVER mix chemicals with cleaning agents, for example, to improve effectiveness; it may result in serious health hazards. Limited to stainless steel and plastics; use on glass is not recommended as it will weaken the integrity of carboys and result in glass shattering and possibly injuries. Many eco-friendly products, including laundry detergents, are now starting to re-place chemical agents with enzymes (biological agents). Examples: Detergents, foaming agents and wetting agents.